The second Soul for Europe conference took place in Berlin in November 2006 as a follow up to the first which was held in 2004. It seems likely to become a regular feature of the European cultural process, reflecting the recognition that further development of Europe ’s unique alliance of nation states will only be effective if it evolves to include common cultural values, goals and conditions of co-existence. A glance at the reports of the two past conferences reveals that these tasks are more complicated than they might seem to those looking from the windows of the European Parliament, the European Commission and the many other institutions created during the half century lifetime of the united Europe project. At that time Europe was a continent that had been torn apart, the scars of war still visible; its populations, recently engaged in killing each other, exhausted. It was the need to survive and overcome these difficulties that brought about economic union. The determination to construct a barrier against future wars and conflicts created political and military union. After more than half a century it has become clear that this is not enough. It is difficult to imagine Europe being fully unified without fixed mechanisms for developing fruitful cultural co-existence between its nations. Since the EU was formed, the European nations have experienced a population surge with the arrival of millions of migrants. Not all of these have been able or willing to adapt to the conditions of living in contemporary Europe. A very complex ethno-cultural and multi-religious situation in Europe has given birth to many problems and conflicts that at first glance look insoluble. As the prototype of a peaceful and effective model of world development, the EU is currently going through a more testing time than ever. This test, which started with the dissolution of the Soviet Union and the break-up of Yugoslavia, continued with war in the heart of Europe – the Balkans. That war re-awakened the old disputes of the continent: interethnic and inter-religious conflicts, xenophobia and a widening social stratification that cannot be solved by paternalistic measures alone. Serious disparities in their economic development between old and new members of the EU, and growing bureaucratization at both pan-European and national government level – all this is just the visible tip of the iceberg. Underneath lie huge layers of inter-cultural and inter-faith oppositions and differences. Put plainly, the Soul for Europe initiative is a first step towards a possible new development in the quality of the EU. The original need was to build the economic and political foundations of a united Europe. And even though the EU has not yet reached idyllic harmony, it is impossible now to negate the economic and political foundations and the advantages of its unification. The next stage, which is likely to be protracted and increasingly complex, includes the step by step creation of cultural interaction, and social and national unity. The geographical spread of Europe, the size of its population, its cultural and national diversity, make this a task unprecedented in its scope. History has seen many failed attempts at unification. The last in which we were witnesses and participants was the “Soviet” project. The main lesson handed down by the “Soviet” project is the following: no attempt to create social harmony by ignoring and destroying national, ethnic, religious and cultural differences can succeed in the long term, no matter how great the sacrifices made in its attempted implementation. Furthermore, any attempt to replace cultural and religious diversity with a uniting ideology, a system of values imposed from above, is doomed to failure. History has many examples of empires and dictatorships that failed for these very reasons. The initiators of the project A Soul for Europe understand that there are many obstacles on the way to finding the parameters for cultural harmony within a united Europe. Even if and when the conditions of mutual coexistence for different cultures in the spheres of religion, philosophy and day to day life have been worked out, the process of implementing and realizing them, and importing them into all aspects of the life of nations, regions, families and citizens will be long and hard. Not all those who addressed the conference demonstrated the required depth of understanding of the project A Soul for Europe. Some addresses demonstrated a narrow, pedestrian understanding of the medium of culture; seeing it merely as a set of activities connected to art, enlightenment and academia that should not be ignored because of the serious economic benefits it can bring. Unfortunately this limited understanding of culture, used mainly by some Eurocrats, is not only unproductive but could demolish any serious fresh venture into the next stage of bureaucratic initiatives. On the other hand the organizers wish to bring into the project not only politicians and bureaucrats but also a wider circle of Europe ’s and the world’s intellectual elite and to address a range of different European social groups. All this gives hope that the project A Soul For Europe will, eventually, germinate and be brought to fruition. The development of Europe depends on the power of culture, which must be used in a sustainable manner. This will help ensure that we have a Europe of Europeans, and not just a Europe of institutions, administrations and regulations. ”The EU has reached a stage of its history where its cultural dimension can no longer be ignored. ” This statement was made by the President of the European Commission, José Manuel Barroso, at the opening of the Berlin Conference “A Soul for Europe”. The venue was located just a few steps away from the Brandenburg Gate, and the conference took place shortly after the new EU president, the Commission, and the newly elected European Parliament assumed office. It was, moreover, the end of 2004, the year in which the European Union was enlarged by ten new member states. The initiative “A Soul for Europe” is dedicated to stimulating, shaping and guiding the process already set in motion by the conference. The initiative is intended to give content to the motto of the Berlin Conference while helping to find ways of putting these ideas into practice. Civil-society initiative “A Soul for Europe” was initiated by a group of private individuals who conceived and realized the idea of the Berlin Conference. The civil-society nature of the initiative is what accounts for its credibility and efficiency and the wide range of topics it addresses. The Berlin group of initiators and the board of trustees – especially Richard von Weizsäcker – enjoy credibility in terms of their profound interest in the project’s Europe-oriented objectives and are above all suspicion as regards their motives in representing the project ’s interests. Members of the European Parliament such as Hannes Swoboda, Elmar Brok and Jo Leinen as well as its president Hans-Gert P öttering, – none of them directly involved in cultural affairs – were among the first to embrace the cause. Another early proponent was the President of the German Bundestag, Wolfgang Thierse, who agreed to approach the presidents and speakers of other European parliaments with a view to securing their interest in the conference. And Matthias Wissmann, Chairman of the Bundestag Committee on European Union Affairs, also worked to gain the support of his opposite numbers in other countries. In addition, Europe’s most important cultural TV channel ARTE, represented by its President Jérôme Clément, has become one of the initiative’s partners. 2. These are the introductory sentences of the preamble to the European Union’s Charter of Fundamental Rights. The European Union has helped secure the longest period of peace and freedom in European history. Given the enmities and animosities that have plagued Europe for centuries, the process of European unification is not only a political and economic achievement. Unifying the peoples and states of Europe is a process that is unfolding an extraordinary spiritual and cultural dimension. 3. The best way to safeguard the achievements of European integration is by promoting a sense of common European identity among the continent ’s citizens, alongside the traditional regional and national identities. By feeling and acting as Europeans, we, its citizens, can help create what Jacques Delors calls “A Soul for Europe”. 4. The initiative A Soul for Europe seeks to help develop dynamic notions of what the “European idea” means and improve awareness of our continent’s cultural assets and potential. Culture helps people to identify personally with the process of European integration and play an active role in it. As Jos é Manuel Barroso put it at the Berlin Conference in November 2004, “… the EU has reached a stage of its history where its cultural dimension can no longer be ignored ”. This cultural dimension can indeed help promote European citizens’ sense of identity with the EU and give Europe a clearer profile worldwide. - The European idea. From which roots and according to which concepts is Europe evolving and what do we hope to achieve by pursuing this development? - The foreign policy defining Europe’s position in the world. What experiences and competences can Europe draw on to make its unique contribution to the world? - The internal structure of Europe, which is organized in accordance with the principles of democracy, the rule of law and Europeans ’ peaceful coexistence. - The structural and promotional policies through which Europe supports the development of its regions. 6. Culture is alive in all parts of Europe. The activities of the cities, regions and nations must therefore reflect the responsibility they share for Europe and demonstrate an awareness of the fact that their cultural work and cooperation are not only of local, regional and national significance but also contribute to the development of Europe. 7. European cultural actors should be aware of their responsibility for Europe and be afforded the appropriate means and scope to meet this responsibility. It is a great pleasure for me to join you at this Berlin Conference on “A Soul for Europe”. Some people tell me that a President of the European Commission should not speak about culture, an area where the main competence remains at the national and regional level. I disagree. The European Commission by definition is the institution par excellence to represent the European interest, and I find it impossible not to talk about something so central to Europe as culture and its meaning for us. So I am determined to speak up for, and highlight, the cultural dimension of Europe. And this conference is an excellent occasion to do so. My thoughts turned to this gathering when I heard that Anna Politkovskaya had been assassinated. The murder of this brave journalist is just one example of an increasing number of challenges to European values. Values like freedom of speech, freedom of the press, and tolerance. So my intention today in Berlin, the heart of Europe, is to issue a wake-up call in the defence and preservation of our values. We need to defend the European spirit of freedom. With world events unfolding as they are, I feel that it is our duty, as politicians but also as individuals, to say today that the European values which bind together our continent and our common project – freedom, humanism and tolerance – are being challenged. I should also make it clear to you all, as movers and actors in the world of culture, that, in the defence of its values and in the fight for its values, Europe needs you! Europe needs culture since culture, without any doubt, contributes to its well-being, its greater welfare and its social cohesion. But, beyond that, Europe needs culture in order to proclaim, at this time of instability, that our values are not negotiable. Europe needs everyone who regards our values and our culture as the fundamental basis of our society. Our values, especially freedom, constitute the “European spirit” around which Europe is being constructed. For Europe is also an eminently cultural invention. It has consciously opted to rise above national, regional and local identities, even while respecting them, and to bring its peoples together by focusing on the common references to their deep roots. European identity is about diversity. And the way we integrate that diversity cannot be based on exclusive identities, but on common values. Yes, deep roots are important, but it is also important to recognise that modern Europeans are grafted onto many different roots, based on the many different peoples and cultures that came before us. In other words, European identity is not based on territories or ethnicity, but on shared values and culture. Europe gave the world humanism and democracy, to both of which it remains profoundly attached. But the novelty of the European project lies in the fact that respect for diversity – in terms of history, language and culture – is at the very core of Europe’s culture and is its natural expression. The contribution made by culture to the defence of this diversity and to this spirit of openness, which are our most precious assets, is, to my mind, more necessary than ever. Globalisation could generate among some Europeans a sense of alienation and even a sense of loss of identity. This should not happen. Europe must respond. And the best response it can give is to preserve its values. By equipping itself to confront the new forms of competition on the world market and by calling on its human capital and its knowledge, Europe can endow itself with the means of constructing a European society that is dynamic, creative and open. Above all, it is by adapting to change that Europe will be able to remain true to its values. It is in this sense, perhaps more than any other, that culture plays a key role in the “European pact”. Culture is the place where creativity most fully expresses itself, and it is a force for innovation and initiative. It is also a vehicle for social integration and hence for social cohesion. Lastly, culture promotes a sense of belonging while paving the way for a plurality of identities. Culture carries real economic weight. It contributes to wealth creation. It creates new jobs. It contributes to innovation, the spirit of enterprise and knowledge. A recent report commissioned by the EU shows that 2.6% of its GDP comes from cultural activities – an enormous amount, in real terms. This is why I do not regard as sacrilegious the idea that culture and creation can stimulate Europe ’s economic and social success. I do not see anything taboo in the idea that the cultural economy can also contribute to European integration. Culture also plays an active role in giving fresh impetus to the European Union through local development. Creative activities, which often have a strong territorial dimension, do not always lend themselves well to relocation. Though, even here, Europe must be capable of holding on to its creative workers, who, like scientific researchers, might be tempted to go elsewhere in a quest for better conditions. Apart from territorial cohesion, culture is, as I have already said, a factor for social cohesion. Cultural activities are among the valuable means of building an “inclusive Europe”. Culture is an essential factor of human development. It improves the living conditions of vulnerable categories among the population, of young people in difficulty and of those who endure poverty or insecurity. In these times of rootlessness and growing solitude, culture provides a link to society at large. By forging links between individuals, culture can influence their participation in collective life. It is from culture that the sense of a shared destiny transcending the diversity of origins and languages springs. It is the weft around which the rich tapestry of values is woven. Culture, then, is the keystone of the sense of belonging and of active citizenship that Europe needs. By facilitating dialogue, culture opens the way to development in an increasingly multicultural and multilingual society. For all the reasons I have mentioned – and about which, I am sure, the Commissioners participating in the conference will talk in greater detail, I see a greater need than ever before to emphasise the cultural dimension of Europe, and to involve young people fully in the project. This is a message to everybody, to artists and intellectuals, to political decision-makers, and to civil society. Events in the world today should impress on us a sense of urgency. Let me return to my main point today. Throughout the world we see fanaticism on the rise. Throughout the world we hear the mutterings of fundamentalisms. Throughout the world we sense that intolerance is taking a stronger hold. Let us not hide the truth. Let us face up with the utmost resolution to the dangers that threaten our freedom and our values. Europe, which “invented” tolerance for individuals, for their opinions, for their beliefs and for their differences, must make its own special voice heard. Let us not hesitate and then one day regret that we did not say “no” in time and out loud. So it is important to defend respect for diversity. But at the same time we must not lose sight of the fact that this respect is based on a deeper respect for certain principles which cannot be negotiated. Freedom of expression, freedom of religion, or the right not to be religious , and freedom of creation are simply not negotiable. A serious threat today is self-censorship. When we start anticipating reactions, and telling journalists, and artistic and cultural creators that they have to show prudence, we are de facto narrowing the space of freedom. There is also a risk that we take such disproportionate action in the interests of greater security that we also narrow the space of freedom. We cannot lose our soul in the struggle against terrorism. Putting our liberty in danger in this way would be a victory for terrorism. At the beginning of the 21st century, we should, all together, reinforce the foundations of our European home. Which means preserve and reinforce our values. Defend freedom of thought. Defend freedom of speech. Defend freedom of creation. Let us never accept that a book should not be published, that a caricature should be censured or that an opera should be kept off the stage! Together, let us defend cultural pluralism and the diversity of cultural expression. Together, let us defend multilingualism, one of the inviolable principles of European integration, and a better understanding between language communities. Let us encourage language learning and the translation of works of European literature, which would enrich us all. Together, let us defend the freedom to create new musical works, new films and audiovisual works, the plastic arts and the performing arts. Together, let us defend freedom through dialogue between cultures, in Europe and the wider world. Let us listen. Let us offer a hand. But let us also assert that, as Europeans, we place our democratic values above everything else. Together, let us defend freedom by asserting the right to dream and imagine in a Europe that is reconciled in democracy, tolerance and peace. Let every one of us, each in our own place, make our own contribution to this heroism of reason so that history – both that of Europe and that of the world – is never again given any opportunity to repeat its past mistakes. I welcome this opportunity to talk to you about “Europe’s soul” in the world. Berlin is a city which simply “breathes” Europe’s history and is at the same time a symbol of our unity. What could be a better place to consider “Europe’s soul” and to ask oneself what it means to be European? The question of Europe’s image is more relevant now than ever before. The world is growing smaller. We are not in a zero sum game. We are earning a massive globalisation dividend. On the other hand, there is a “dark side” to all this: extremism and the spread of weapons of mass destruction, the impact of regional conflicts on security, the economy and energy supply, not to mention migration and climate change. The answer, however, is not to retreat into a “Fortress Europe”. We cannot safeguard Europe’s prosperity and values by “opting out” of history. Globalisation is taking place. And Europe must go on the offensive if it is to help shape its course. The EU is not the Trojan horse of globalisation, but our answer to it. “Globalisation management”: that is the EU’s raison d’être today. A stronger EU on the world stage is not only a question of efficiency; it is also a contribution to the Union ’s legitimacy. The current “dissatisfaction with Europe” has a lot to do with fear of globalisation. Over two thirds of all EU citizens would like to see a stronger EU external policy. It is up to us to provide it. Such an EU external policy cannot, however, be a value-free realpolitik. That would be both out of keeping with the way we see ourselves and counterproductive in an interconnected world. In these changing times, it is important that Europe should be mindful of its inner compass, of its “soul”. For Europe is not only an economic entity; it is a spiritual and cultural one as well. This is not to take refuge in abstractions. It means placing substantive emphasis on our fundamental values. It means building on that tradition which we hold dearest. On our basic values, our civilisation, ideas about the future, emotions and ambitions. Our values, our “soul” and our culture are not “museum pieces”, but on the contrary future building blocks for a globalised society. Our culture creates an identity in turbulent times, an inner understanding, a sense of togetherness. It is not, therefore, an intellectual luxury, but a vital political construct. Europe is above all a community of values. That is important in world politics. For Europe’s considerable soft power is based on the global gravitational pull of our guiding values. The vast majority of people in the world view Europe as a power for good. That is a fact of which we are far too little aware. It should not be the case that our partners are bedazzled by Europe ’s success, while Europeans themselves bemoan it, as Jean-Claude Juncker so aptly put it. We need to resolve this paradox. It is virtually impossible to sum up Europe’s richness in a few words. Allow me, however, to make an attempt at it, starting with Paul Val éry, who said that Europe was born of three sources: Jerusalem, Athens and Rome. Our cultural basis is our Judeo-Christian heritage, as modernised by the Enlightenment. It is the triad of spirituality, democracy and individual freedom based on law. Let me throw a few key concepts into the ring and explore them in greater depth as I go along. First of all, Europe stands for a culture of diversity and not for a culture of uniformity. Not for nothing is our motto “united in diversity”, and not “e pluribus unum”. The fascinating thing about Europe is this small-scale mosaic, which – patchwork though it is – can trace its origins back to common thoughts and currents. Just think of Europe’s music, literature and architecture, as exemplified, for instance, by the common features of our architectural heritage, from the romanesque to the modern. This is an expression of a collective “cultural unconscious” slumbering inside of us. It is the sum of our historical experiences, which we should take as a basis for our future policy. This diversity also demonstrates that the removal of frontiers does not lead to an “abandonment of self” or to a loss of identity. On the contrary: people actually gain in substance through the crossfertilisation. Our diversity is therefore a strength in a global information society. Europe is a successful example of “globalisation writ small” – politically, legally and economically, as well as culturally. We must make much better use of this “inter-cultural know-how”. Conversely, this diversity is doubtless also a challenge, especially to the political cohesion of our societies. What we need is a new basic consensus. We need an unequivocal declaration of belief in our value base, not least by immigrants. Standing up for open societies means more than indulging in ideological arbitrariness. A second fundamental value, related to the first, is that Europe stands for a culture of freedom. Europe means defending the inviolable dignity of the individual and his freedom of choice. Europe is, however, also the contrast between freedom and responsibility. It is the deep humanism of Erasmus and the sharp irony of Voltaire. It is the love of freedom in Schiller ’s Don Carlos and Beethoven’s Fidelio, just as it is the tolerance of Lessing’s Nathan der Weise. As the basis of a liberal society, this tolerance is particularly important now, at a time when what some see as the “clash of civilisations” threatens to become a self-fulfilling prophesy. Chancellor Merkel was right when she recently said that Europe has a future only as a “continent of tolerance”, in the sense of “tolerance as the capacity for serious dialogue”. Tolerance is based not least on the realisation that, as the holder of rights and obligations, the individual lies at the heart of ethics. Europe is thus the birthplace of individualism. Not only that, but we have learnt from the excesses of the era of the masses and the catastrophes of collectivism in the 20th century. But individual freedom is not unfettered. It is socially embedded, it depends on “ligatures”, as Ralf Dahrendorf put it. It must not undermine itself. That, too, is European. This manifests itself in our understanding of economic freedom: we must preserve the essence of Europe ’s blend of entrepreneurial freedom and social security, our declared belief in a social market economy. We need reforms for precisely that purpose. We must radiate this balance towards the outside world. For globalisation can function only if it is an inclusive process and people do not go by the board. Thirdly: Europe stands for a culture of law; for the strength of the law, and not the law of the stronger. One of the civilising achievements of integration is that it has raised law to a supranational level. Our Community based on the rule of law is not an administrative project, but a cultural feat. We must now drive this fundamental juridification forward at the global level, towards an effective multilateralism. A strong international legal order is, however, not an end in itself but the backbone of a complex world. Globalisation is not taking place in a political vacuum. It needs rules of the game in order to function and to be able to realise its potential. One example of this “export of the rule of law” is the new EU-China Law School, which will help to integrate China and its young elite into the global concert. Fourthly: Europe stands for a culture of conflict resolution. The “founding spirit” of our integration project is the abolition of “war as the continuation of diplomacy by other means”. In saying that, I do not wish to fall back on a cliché such as “Europe is from Venus, the USA is from Mars”. Europe may be not unlike the Kantian paradise of peace and the rule of law, but that does not mean that we can wall ourselves off. The large, complex conflicts of the past 15 years or so have shown that lasting conflict resolution must be of a political, and not purely military, nature. We must therefore focus on the deeper roots of conflicts and radicalism. Nowadays, long-term state building is one of the most important forms of security policy, aimed as it is at preventing the formation of “black holes” in the international system. With its broad, post-modern external policy, the EU can make a significant contribution here. And that policy must in turn build on values. For conflict resolution is based on respect and an ability to relativise, without, however, giving up one ’s own “core values”. Fifthly: Europe stands for a culture of creativity. The Faustian search for knowledge, the genius of Leonardo da Vinci, but also Hamlet ’s doubts, together with scepticism and critical thinking – these are all part of the “conditio europea“. We cannot leave them to lie fallow. In the 21st century, human capital is our most valuable raw material. We must invest more in it, both financially and, above all, socially. Chancellor Merkel has rightly pointed out in this connection that Europe must be mindful of its “creative imperative”. You can see how strong the international dimension of Europe’s “soul” is. Getting it across is therefore not only a question of our moral self-awareness. It is also in our own self-interest. Our fundamental values are cornerstones of open societies. Promoting them worldwide creates security. By supporting good governance, we are strengthening the fabric of globalisation. We have to acknowledge that, in the recent past, a lack of co-determination, human rights violations and economic misery have given birth to a radicalism that does not stop at our borders. Which is not to say that we simply want to “export”, or even impose, our culture. I am not pleading in favour of “liberal imperialism”. That would be inappropriate and counterproductive. Instead, we must cautiously contribute to a “homegrown” system change that takes account of the basic human need for freedom and co-determination. The universality of this value substratum is reflected in the UN Human Development Reports on the Arab world. These illustrate how strongly people in the region yearn for reform and democracy. Let us remember also that on the Square of Heavenly Peace in Beijing in 1989, Beethoven ’s Ninth Symphony was being played as the tanks rolled in. In short, in the words of Victor Hugo: “One can resist the invasion of an army but one cannot resist the invasion of ideas ”. The EU must therefore spread the “soul” of its external policy. Through diplomatic negotiation and targeted pressure, through dialogue with civil society and with religious leaders; through the promotion of human, and in particular women ’s, rights, and through economic and financial incentives, including in the area of education, in order to counteract the explosive freedom and gender deficit in many parts of the world. Our experience with the “caricatures crisis” of early 2006 has shown us how to cope with this challenge: firm in our principles, but ready for dialogue. We must forge an alliance of civilisations, as Prime Ministers Zapatero and Erdogan suggest. Navid Kermani, who will be speaking to you tomorrow, is right in saying: “Europe is the geographical expression of the universal idea of the Enlightenment”. “Europe’s borders” must accordingly be defined not only geographically but also in terms of political philosophy. Anyone who shares these values unreservedly can be a European. Ladies and Gentlemen, this brings me to the conclusion of my address. Not only does Europe have to face up to economic competition, but it is also engaged in a global spiritual contest. Whoever seeks to prepare Europe for the struggle must hone his value awareness. Capitalising on the success of our European project therefore involves ideas, and not just institutions. You all know the famous words of our founding father, Jean Monnet: “If I had to do it all over again, I would begin with culture”. In other words, “Europe makes culture”. But above all, “culture makes Europe”. This cultural imperative holds true today more than ever before. “No one falls in love with an internal market”, to quote Jacques Delors. This value awareness calls for political awareness. It is up to us to project more strongly the “European way of life“, our freedom, openness, diversity and respect for the rule of law, so as to reinforce the basic identity of the European project. It is our duty to spread this way of life. This is what is at the heart of EU external policy in the 21st century. What is involved, therefore, is not just Europe ’s internal make-up, but also its international “mission”. Perhaps Europe’s global role is a new European narrative in embryo form. That would be – to paraphrase Derrida and Habermas – the “rebirth of Europe from the spirit of globalisation”. It is an important place and time for Europe. 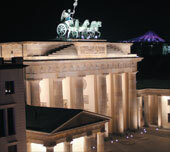 The Brandenburger Tor is the symbol of the German and the European reunification. On 17 November 1989, the “velvet revolution” started in Czechoslovakia. The quest for freedom and human dignity has been leading us all towards our current unity. It is good to be back after the ground–breaking Conference of November 2004. The process that was set in motion here in Berlin has put culture firmly on the table of the debate on our united Europe. In these years there are many discussions and questions about crisis in Europe or about future of Europe. There is a lot of apathy and skepsis around. I think it is the culture which can give decisive contribution to the European unity: values and political force. ‘A Soul for Europe’ has evidently brought to the fore a sentiment that was running like an undercurrent in various circles across the continent. It was loudly called for by former President of the Commission Jacques Delors. And before, by Robert Schumann, Europe ’s Founding Father, this appeal was put into his famous message, enshrined in his book Pour l ’Europe. I congratulate the project’s initiators and organisers for that. The European Commission welcomes this process. I personally commend its vitality and I am happy to see that the Commission and other EU institutions are participating actively in it. I have been asked to focus my speech of today on the intercultural dialogue. But I would first like to say a few words on the link between culture and the Lisbon growth and jobs agenda. We have just published a study on the Economy of culture in Europe. I presented it to EU culture ministers at a Council meeting earlier this week. This is a very interesting document. It highlights both the direct contribution of the cultural and creative sectors to the Lisbon Agenda (in terms of GDP, growth and employment), as well as the indirect contribution (links between creativity and innovation, links with the ICT sector, regional development and attractiveness). 1.9 % for the food, beverage and tobacco industries. It employs 5.8 million people (and this is a conservative estimate). Our research confirms that the cultural and creative sectors have a significant impact on growth and jobs. We have to overcome the usual image of a dichotomy between economy and culture. The EU should help to build an environment that stimulates creativity in our economies and societies. Creativity and innovation are essential for growth and competitiveness in the knowledge era. Let me add one thing in this respect. Support to the cultural industries is often perceived as an extravagant expense. However, nothing could be further from the truth. Culture is not a luxury; it is in fact an extremely sound investment. Every Euro spent on culture generates large returns in economic terms – as I said – but also in terms of employment, quality of life and social benefits. Artists and cultural operators are – among other things – the critical conscience of our societies. A lively cultural scene helps us reflect on who we are, what keeps us together, where we want to go. And we are already preparing the next step: an ambitious political Communication on Culture, which I will present in the first half of next year, under German Presidency. Cultural operators and artists can contribute a great deal. One notable example is the “Civil Society Platform for 4 Intercultural Dialogue”, which is just starting to take shape. This is an initiative led by the European Forum for Arts and Heritage, the European Cultural Foundation, and the Network for European Foundations. I am glad also to see that the “Soul for Europe” will take part in this platform. Let me now move on to the Commission to organize 2008 as the European Year of Intercultural Dialogue. I launched the idea as soon as I was appointed Commissioner for Education and Culture. My proposal quickly gathered consensus and it is now planned for 2008. There are plenty of good reasons why the Union should work on intercultural dialogue; let me give you just two of them. Firstly, building Europe has always meant integrating histories, value systems, and world views. There is a strong sense in which our process of integration has always been a dialogue between cultures. The EU is traditionally committed to promoting cultural diversity and intercultural dialogue around the world. The second reason why this is the time to focus on intercultural dialogue is that Europe ’s cultural landscape has grown more diverse in the past few years as a consequence of its enlargements and of immigration. It is now common for European cities – large and small – to host many different cultural, religious, and language communities. I think that diversity in unity is the best narrative for Europe in the XXI Century. Unfortunately this new “richness” is not lived or viewed positively by all. I do not need to remind you of some of the worrying tensions in our societies. If we are serious about building a peaceful and creative society for tomorrow we need therefore to build a culture of dialogue and understanding now. Future starts – as always – today. The policy move is necessary and urgent, but it won’t be easy. That is why the intercultural dialogue became also one pillar within the new programme Culture 2007. - finally, intercultural dialogue is linked to a more political goal: creating a sense of European citizenship. It is clear that intercultural dialogue is relevant not only within the EU but also in our relations with third countries. Although the proposal is focussed on the territory of the EU, other countries will be associated, particularly our neighbours in the rest of Europe and around the Mediterranean, through our civil society dialogue with candidate countries, including cooperation with the Anna Lindh Foundation. I want to stress that we recognise that ultimately intercultural dialogue is a bottom-up process. It is for this reason that the Commission wants to work with a wide array of partners: national governments, regional and local authorities, and of course civil society. Indeed, we need to learn from the grass-roots. That is why we have asked civil society to send us their ideas for the initiatives which will be funded by us as part of the Year. We believe that learning from best practices is essential. Indeed, next week, we will host a conference and exhibition in Brussels identifying good practices of projects funded by Community programmes. We are also launching a study on Member State approaches to intercultural dialogue, and the results should be available by next summer. I often hear sceptical voices, doubting what we can achieve with a single Year. I understand these concerns. However I want to underline that the Commission wants this European Year to be the beginning, not the end of something; the start of a truly long-term, durable process that lasts well beyond 2008. As of next year, all the policies under my responsibility will be used to promote dialogue between cultures, and the same will also apply to some of our external policies. It will remain a priority in years to come. - Thousands more citizens involved in our citizenship programmes, each year, including town twinning exchanges each year. The objective and the criterion of culture must be promotion and respect of human dignity. This is the first value which unites us. Relation to human dignity is actually a defining line in relation to humanity and civilizations. I believe that maintaining an open, peaceful and constructive dialogue among all the political, social, and cultural partners is absolutely essential. In effect, I would like to put forward the claim that this permanent dialogue is the very proof of Europe ’s living and sharing soul. Dialogue is not weakness; it is a sign of maturity. In a dialogue, 1 + 1 is more than 2, because it brings synergy – more and new knowledge, understanding and relation. It is true in a family, in a community, in a nation, between nations. Because indispensable values for any sustainable community – humanity and solidarity – are the functions, the products of a responsible, emphatic human soul. To give a soul for Europe is very important, hence – as Jean Monnet said very wisely – “we are not building an alliance of states, we integrate people”. I‘m not sure whether it is pure coincidence or whether it was deliberate that I am down on the programme to talk on the subject of “Civil society and politics from the perspective of the national parliament”, whilst Hans-Gert Pöttering will then look at the same issue from the perspective of a “European parliamentarian”. I myself will be interested to see the extent to which this leads to two different perspectives on the same topic. In terms of basic principles, I am fairly sure that a broad consensus exists not only between the two of us, but probably amongst the participants in this conference as a whole, that a free society requires not only a democratically elected government and a parliament with political responsibility, but also an active civic society, and that neither should be allowed to replace the other. Whilst this interaction and network of links between civic society and democratic institutions is vital in general, this is particularly the case for the field of art and culture. One of the practical questions which must be asked concerning operative responsibilities concerns the allocationof responsibilities to particular persons or bodies, initially from a national perspective. The second question is: what does this mean for the relationship between the different Member States and their civil societies and the European Community within a constitutional framework? I should like to share a few thoughts on both these questions. Since its very foundation, the Federal Republic of Germany has regarded itself as a country of culture. This has been explicitly underlined in a range of declarations, not least in some rulings made by the Federal Constitutional Court. And, incidentally, it was reflected directly in terms of constitutional law and international law for the first time in the Unification Treaty: the treaty through which the two German states cemented national unity. Germany ’s image of itself as a country of culture naturally does not mean that responsibility for art and culture should essentially be seen as a matter for the state and is anchored there. Nevertheless, Germany ’s image of itself as a country of culture does distinguish it from other states and societies with the European Community in some ways – there is a belief which has developed over the centuries that promotion of art and culture is essentially a task for the state. The fact that the state has particular responsibility at all levels for promotion of art and culture is reflected, incidentally, in the fact that almost exactly 90 per cent of all expenditure on art and culture comes from public budgets. And the fact that what does, thank God, exist within an increasingly active civic society in terms of private involvement, private foundations and sponsoring activities – without which conferences like today’s would scarcely be possible – constitutes less than 10 per cent of overall spending on art and culture in Germany. Incidentally, this does not allow us to draw final and adequate conclusions about the importance of one or the other. It does, however, make clear the extent to which this country, this state, these constitutional institutions, view the promotion of art and culture as a public function – and this has certainly not only been the case since the establishment of the second German democracy. It is the continuation of a long historical development and tradition. I very much hope that this remains the case and, as far as the Bundestag is concerned – the body for which I am, after all, intended to speak today – I have no doubt that its organs and institutions place great value on the continuation of this tradition. This not only applies to the Committee on Cultural and Media Affairs which is particularly concerned with this topic. It also undoubtedly applies to the views shared by the leaderships of the parliamentary groups, the other committees and the other bodies and organs of the German Bundestag. At this point, the first contrast occurs to me – one which is certainly not insignificant. In terms of concrete measures to promote art and culture, the ambitions of the European Community are extremely modest. The resources earmarked appear – to put it rather uncharitably – ridiculously small. Viewed from a purely statistical point of view, the scale of them seems almost grotesque compared with the resources which the European Community views as necessary to promote agriculture, for example. I only mention this by way of illustration and obviously do not aim to examine conclusively in an aside the relevance of one or other of these things. In fact I should like to stress that I do not believe it vital or even necessarily desirable for the European Community to aim to take on greater responsibility for direct promotion measures in the field of art and culture – though I realise that this conclusion may be frustrating for some of you. I believe that the efforts involved in establishing this form of European support framework would not be in sensible proportion to the success thus achieved, and my experiences with European support programmes in the area of art and culture tend to reinforce my scepticism, rather than inciting me to propose that they should be massively expanded. Perhaps Hans-Gert P öttering will mention in his speech whether, and to what extent, alternative ideas exist from the perspective of the political groups in the European Parliament. And, by the way, this brings us directly onto the subject of the Constitutional Treaty, which has with good reason repeatedly been stressed as important, or at least mentioned, at this conference. One of the main topics at issue here is the question of division of responsibility between the European Community and its Member States. Naturally, it is a matter of how the Community sees itself, which is linked to how the Member States see themselves – the fact that operative responsibility for education, along with art and culture, lies with the Member States and not with the European Community. This means that independent responsibilities for the European Community in such tasks may only be established or further developed in a few specific areas, which can be identified with almost surgical precision and where opportunities open to the Community tangibly exceed what can be achieved by the individual Member States. Nevertheless – to return to an issue which we mentioned or heard mentioned a number of times in the opening speeches yesterday – when we talk about the European constitutional Treaty, we are not only talking about the responsibilities of the Community and those of the Member States and about structures which this Community needs to take action in many policy areas. We are also talking – and must talk – about the central values and directions which form the very foundations of the Community. And from the point of view of a national Parliament too, I should like to urge that this truly fundamental perspective should not be forgotten in any of the efforts to reactivate the Constitutional Treaty. I firmly believe that there is no chance of the internal consistency which we urgently need within the European Community, if we do not return to the cultural foundations, and thus the values, the principles, the directions on which this Community is founded. I therefore believe strongly that it is precisely from this point of view that the reactivation of the established shared cultural beliefs and principles is one of the prerequisites for the future European Community Constitution. And, incidentally, this is even the case regarding future boundaries of this Community which, for me at least, cannot be plausibly justified except in terms of the cultural identity of this Community. Finally, I would like to make a practical suggestion which can perhaps be linked with the follow-up activities to this Berlin Conference and the other activities planned in the meantime on a somewhat smaller scale and, above all, in a decentralised fashion. I think the idea of naming a different European city Capital of Culture each year, as has been done for over 20 years, was a good idea whose long-term effects only became clear over the course of time. These cities become involved in particular activities to showcase national and European art and culture over this year. And I believe great opportunities are presented by the fact that, having worked its way through the major capital cities, the European Community is now venturing further out into the provinces – in the most positive sense of the word – and showcasing and creating access to the wealth of art and culture which naturally is not only to be found in the capital cities and which particularly deserves greater public attention. Next year, we will have two Capitals of Culture in Europe – Luxembourg and Sibiu – and, from then onwards we will almost always have at least two, if not three European Capitals of Culture. Generally, one of them will be from the “old West Europe” and one from the “new Member States”. In 2010, one of the Capitals of Culture will once again be in Germany. For the first time, it will be a whole region – the Ruhr. And, at the same time, the city of Pécs will be Capital of Culture for Hungary. A decision has also been taken to include a city outside the current set of Member States of the European Community – Istanbul – in this circle of European capitals and metropolises of culture. I believe it is worth considering creating a close network between the range of European Capitals of Culture from the past twenty years, most of which were national capital cities, and the European Capitals of Art and Culture over the next 10 – 20 years, which will be much more decentralised. The ties created, sometimes at a personal level, between cultural decision-makers in politics and civil society would allow ever closer links to be forged on all the topics being addressed at this conference. I believe this would not only be a good opportunity for an exchange of experience as to how the promotion of art and culture can be organised more or less effectively using varying degrees of leverage – particularly with regard to combining public and private involvement. Above all, it would be a brilliant opportunity to cultivate this spirit and constantly reactivate it year after year in order to make a true practical contribution to the goal of this conference: – creating “A Soul for Europe”. In 1554, the Flemish mathematician and cartographer, Gerhard Mercator, produced the first more or less accurate map of Europe. With this map, he was able to give Europeans an idea of the geography of the continent and its borders. Culturally, however, the Europeans had known long before this that the continent of Europe is one single unit. Today, however, you sometimes get the impression, that the exact opposite is the case. Sure, our European citizens are familiar with the map and the borders but they are not really aware of what really constitutes Europe. So I ’m very happy to see you here in Berlin at what is now the second conference looking at the cultural soul of Europe. I would like express my sincere thanks to Volker Hassemer and Nele Hertling for taking the initiative in this respect. The Federal Government considers this conference to be an important plea in favour of European culture and consequently is consciously supporting and promoting this event. Conveying a positive picture of Europe to people is a huge challenge. I am convinced that culture must always be at the very centre of all such efforts. Because Europe has always been a cultural unit. Paradoxically, this unity exists because of cultural diversity. I ’ll go even further than that and say that the tense relationship between unity and diversity is what made Europe a stronghold of liberty in the first place. Blaise Pascal once summed up this relationship very clearly, saying that “plurality which is not reduced to unity is confusion. Unity which does not depend on plurality is tyranny ”. The frequently criticised technocracy in Europe puts many people off. The European Union will only survive if it is also, and above all, seen as a community of culture and of values. We must voice this more clearly in the future. In the first half of 2007, Germany will assume presidency of the Council of the European Union. This will give us in Germany, as cultural politicians and culture creators, the opportunity to present our country as a major European cultural nation in Brussels. The many cultural framework events planned during the German presidency will enable us to grasp that opportunity. On this subject, allow me to mention in particular two major exhibitions being held in Brussels. The “Views of Europe” exhibition, to be opened by the Federal Chancellor on 7th March 2007, will look at how Europe was perceived in 19th century German art, whilst the “Visite” exhibition will exhibit some of the works from the Federal Art Collection. The presidency of the Council will also provide the opportunity to reinforce and raise the profile of cultural policy as an advocate for all cultures in Europe. One thing you can be sure of: the Federal Government will carry out its duties in this regard with the utmost vigour! At the first Berlin conference two years ago, Germany, France and Poland proposed a European cultural charter project. I ’ll make it quite clear to you now that yes, I too am in favour of getting this up and running. If we truly want to make Europe more accessible for people we must provide easier access to our common cultural heritage. This is my motive for lending my wholehearted support to the European Digital Library project. During the German presidency of the Council, one of my focal points, as chairman of the Council of Ministers for Culture and Media, will be to drive the “Television Without Frontiers” European Directive much further forward. This too is ultimately a cultural issue because it is always important to strengthen diversity and maintain the plurality of opinions. The television Directive is the centrepiece of European legislation in the audio-visual field. It creates the conditions for the free movement of television services within the European Union and as such promotes the development of a European media market. The “Television Without Frontiers” Directive was negotiated in 1989. Though it was amended in 1997, it did not radically change. New transmission methods for audiovisual media services and the change in economic conditions that they brought about have made further adaptations of the Directive necessary. You will perhaps be aware that the Federal Government had one particular objection to the revised version of the television Directive favoured by the Commission, namely that it allowed for so-called paid-for product placement. In Germany, the separation of advertising from programme content is a fundamental principle of journalism – indeed, it is also a fundamental cultural principle in the truest sense of the word. Our persistence has paid off and we have achieved at least partial success. Along with our European ministerial colleagues, we have come to a majority decision in favour of a compromise put forward by the Finnish Council President, which fundamentally prohibits product placement, but allows each Member State to permit it within its own national laws, albeit within narrow limits and under specific conditions. This is a major change in direction, compared with what the EU Commission had originally planned, and it would not have been brought about had the Federal Government and the Federal States not held so steadfastly to their views. I also consider myself to be an “advocate of culture” and as such I must also focus on the cultural dimension of the media. Consequently, I also see the European “Television Without Frontiers” Directive from the point of view of cultural policy. The EU television Directive will help to ensure that cultural diversity and plurality of opinions in Europe is also given sufficient consideration in television programmes. It ’s my intention to discuss this matter with my European colleagues whom I have invited to an informal council meeting on 12th and 13th February on the occasion of the Berlin International Film Festival. Culture doesn’t just have a non-material, spiritual dimension, but to a considerable extent an economic one too. Culture and business are not mutually exclusive. On the contrary, it ’s often overlooked that, in Europe, the economic sectors with the highest growth rates are the cultural and creative industries. In certain circumstances they are even turning out to be “job motors”. Consequently, it was a mistake that Europe’s cultural and creative potential was given little or no consideration when the Lisbon Strategy was being formulated. Indeed our goal of keeping Europe as one of the most competitive regions in the world is one of the very reasons why we should not forget the relationship between culture and business. What would Berlin be, for example, without culture and the surge of tourism that we experience purely because of this culture? In Europe, there is still room for developing cultural tourism in particular still further. Our fantastic art treasures and sites of cultural interest have a magnetic attraction for tourists from all over the world. It ’s essential that we build on this. It is high time that we put a stop to one long-nursed prejudice – namely the view that culture always costs money. In fact, culture also brings in money and creates jobs. If we emphasise this more strongly we won’t be weakening the intrinsic value of culture. On the contrary, we will be underlining it, as well as providing another important argument for the principle that the promotion of culture is not all about subsidy but is rather an investment in the future. Therefore, I would like to make the issue of cultural economics the second focal point of my work during the German presidency of the Council of the European Union, alongside the television Directive, and place it on the agenda for the informal meeting of ministers in Berlin on the 12th and 13th February. During its presidency of the Council, the German government will do all it can to ensure that Europe can progress determinedly towards integration. In this respect, culture is a key factor and should therefore play a more central role in all our efforts than it has done in the past. This Berlin conference on European cultural policy is making an important contribution to ensuring that Europe is given a soul. The Calouste Gulbenkian Foundation supports the movement “A Soul for Europe” since the Berlin Conference of November 2004. This support represents our commitment to the strengthening of a “united Europe”, leveraging the value of cultural diversity and fostering a deeper mutual understanding of all the peoples of our continent. I am sure that Compagnia di San Paolo, the Riksbanken Jubileumsfond and the Robert Bosch Stiftung, our partners in this joint-venture, share the same rationale for this project-sponsoring. The partnership between our four foundations has two far-reaching objectives: first, to revitalize the relationship between civil society and political European institutions, and second, to resonate and disseminate the issues this initiative brings to the fore. On what concerns the first objective, we must remember the double legitimacy of the European Union. In fact, the European Union is not only a union of sovereign States, but also a union of peoples which share a common supranational European citizenship. In the quest to find the balance between these two dimensions of European integration, the European cultural dimension could emerge as a catalytic element. For most part of the European success story, the Economy was the most visible mechanism to promote growth and to overcome the differences between member states. Present external challenges and the expectations of European citizens call for a more political, social and cultural approach. Jean Monnet said that “… les homes n’acceptent le changement que dans la nécessité et ils ne voient la nécessité que dans la crise.” (Men only accept change in face of necessity and are only aware of necessity when in crisis). It is our duty to respond to necessities and to avoid crisis. It was the sense of disconnection between the European Union institutions and European citizens, expressed by opinion polls, that lead the European Commission to the preparation of a “Communication on Culture” to be adopted in the first quarter of 2007. One purpose of this communication is to analyze both what Europe can do for culture and what culture can do for Europe. Please allow me to briefly contribute to this double perspective debate. e) To facilitate the learning of non-European languages (e.g. Arabic, Mandarin, Persian, Hindu) as a factor of openness and of immigrants ’ integration. On what culture can do for Europe, I would first underline that culture can reinforce our common values and can move-forward the notion of European citizenship. Second, culture could leverage innovation and competitiveness through the promotion of creation and creativity. A more dynamic and creative environment can be a positive factor for the accomplishment of the Lisbon Agenda goals. A recent paper of ECP clearly shows the interaction between creativity – innovation – competitiveness. The key figures of the study on the Economy of Culture in Europe that the European Commission revealed this week clearly demonstrate the impact of culture and creativity on the European economy: the cultural and creative sector contributed 2.6% of the EU GDP in 2003; the growth of the cultural and creative sector in Europe, from 1999 to 2003, was 12.3% higher than the growth of the general economy; in 2004, at least 5,8 million people worked in the sector, equivalent to 3,1% of total employed population in Europe. Third, as biodiversity is essential to our survival and development, we should use the cultural diversity of our continent for the European project benefit. Civil society institutions have a special role to play on what concerns intercultural, interethnic and interfaith dialogue. Foundations, in particular, as independent bodies have the capacity to develop their work cross-borders and cross-beliefs. Foundations can indeed foster mutual knowledge through networking and issue-based cooperation. We can broaden exposure to transnational experiences, strengthening intercultural dialogue and mutual understanding. This is a clear commitment of the European Foundation movement, assumed by the European Foundation ’s Centre (EFC). Europe will inevitably and increasingly be more intercultural. Civil society institutions can and must help to adopt best practices in fostering the understanding of the migrations phenomena. They should also play a key role in favouring minority cultures integration. Civil society should contribute to a paradigm shifting based on the following perspectives: bringing together artists and scientists, helping to cross different methods and perspectives while promoting creativity practices at different levels; and helping to find new approaches which go beyond the traditional Eurocentric essentialism and promote the comprehension and dialogue between different cultures. Civil society can also help to convey the concerns of European citizens to the political decision bodies through participatory mechanisms such as the initiative European Citizens ’ Consultations promoted by the Network of European Foundations for Innovative Cooperation (NEF), which also supports the project “A Soul for Europe”. The initiative “A Soul for Europe” shows itself to be a new model of civil society participation. A stronger and wider “A Soul for Europe” alliance can provide a new opportunity for civil society to move forward the European agenda..
Europe is in search of its identity. I don’t think one needs to look very far. To my mind, the European Union embodies the principles of an open society and it ought to serve as a model and motive force for a global open society. The concept of open society was first used by the French philosopher Henri Bergson in his book The Two Sources of Morality and Religion published in 1932. One source is tribal and that leads to a closed society whose members feel an affinity for each other and fear or hostility toward the other tribes. By contrast, the other source is universal and leads to an open society which is guided by universal human rights and seeks to protect and promote the freedom of the individual. This scheme was modified by the Austrian-born British philosopher, Karl Popper in his seminal book The Open Society and Its Enemies published in 1944. He pointed out that open society can be endangered by abstract, universal ideologies like communism and fascism which claim to be in possession of the ultimate truth. Popper was a philosopher of science and he argued that the ultimate truth is beyond the reach of the human intellect. Even scientific theories cannot be verified beyond doubt; they can only be falsified and it is only the fact that they can be falsified that qualifies them as scientific. We cannot base our decisions on knowledge alone and our imperfect understanding introduces an element of uncertainty into the world in which we live that is very difficult to cope with. Ideologies like communism and fascism seek to eliminate uncertainty but they suffer from a fatal flaw: They are bound to be false and misleading exactly because they claim to be in possession of the ultimate truth. These ideologies can be imposed on society only by using various forms of repression. By contrast, an open society accepts the uncertainties inherent in our imperfect understanding (or fallibility), and seeks to establish laws and institutions which allow people with divergent views and interests to live together in peace. The distinguishing feature of these laws and institutions is that they safeguard the freedom of the individual. The Second World War resulted in the defeat of the Nazi regime and its ideology. Europe was rebuilt with the generous help of the United States and eventually a process leading to the formation of the European Union was set in motion. The European Union became a textbook example of the open society. It consists of a number of nations and nationalities, none of which occupies a controlling position and all of which are pledged to maintain democratic institutions and protect individual freedoms and human rights. Even this may be appropriate to an open society because, as Karl Popper argued, our imperfect understanding does not permit permanent and eternally valid definitions of social arrangements. The arrangements must reflect the will of the participants and they must be open to adjustment and improvement. Accordingly, he refused to provide a definition of open society. The European Union was brought into existence by a process of piecemeal social engineering, the method Karl Popper considered appropriate to an open society. The process was directed by a far-sighted and purposeful elite which recognized that perfection is unattainable. It proceeded step by step, setting limited objectives with limited timetables knowing full well that each step would prove to be inadequate and require a further step. The process was helped along first by the threat from the Soviet Union and then by the globalization of the economy which tended to favor larger economic units. That is how the European Union was constructed, one step at a time. The process has now ground to a halt. The European Constitution was defeated by the referenda held in France and the Netherlands. The Constitution may have been, in any case, an over-ambitious step. The Union is now left in an untenable condition with an enlarged membership of twenty-seven and a governing structure that was originally designed for six, although it managed to function for fifteen. The political will to keep the process moving forward has eroded. The memory of past wars has faded and the threat posed by the Soviet Union has disappeared. The prevailing arrangements are too cumbersome and — unless the forward momentum can be regained — the dissatisfaction with the present state of affairs is liable to generate momentum in the opposite direction. That is already happening. Nationalist, xenophobic, anti-Muslim sentiments are on the rise almost everywhere, aggravated by the failure to integrate immigrant communities. The situation is all the more disturbing because the disarray within the European Union is matched by the disarray in the world order. The United States used to be the dominant power in the world. It used to set the agenda for the world. But after the terrorist attacks of 9/11, President Bush declared war on terror and that was the wrong agenda executed the wrong way. As a result, the United States has lost power and influence in a precipitous manner and is no longer in a position to set the agenda of the world. Nor is it in a position to project overwhelming military power in any part of the world as it was when President Bush announced the Bush doctrine, and as a result the world order has become much less stable. Indeed, it is threatening to descend into world disorder. The proper role for the United States would be to lead the world in a cooperative effort to deal with the problems that confront humanity and can be dealt with only by greater international cooperation — such as the threats posed by rogue regimes, the breakdown of the nuclear non-proliferation treaty, climate change and the need to maintain stability in the global economic system and reduce poverty. In the past, the United States fulfilled its role as the leader of the free world. After the Second World War, the United States used its power and influence to establish the United Nations and the Bretton Woods Institutions and to engage in The Marshall Plan. That is what made America great. The Bush doctrine and the war on terror was a sharp break with the American tradition. It left the world leaderless and the world is in disarray. The EU needs to play a more active role in the world than it has in the past. The EU is used to taking its lead from the United States, reacting to its agenda, sometimes positively, sometimes negatively, but it basically accepted the world order as given. That has to change and it cannot be achieved by individual countries acting on their own. The European Union cannot possibly take the place of the United States as the leader of the world. But it can set an example for the world in international cooperation both within its own borders and beyond. Indeed, it has already done so. Member states have delegated some aspects of their sovereignty in order to create a common market and they have kept the prospect of membership open to others. This has been a powerful tool in turning candidate countries into open societies. All that is needed now is for the people of Europe to be inspired by the idea of the European Union as the embodiment of the open society ideal and the motive force for a global open society. What does this mean in practice? I believe the debate about the Constitution should be shelved; that is not what the people are interested in. Whatever the reason, the Constitution was defeated in two referenda. To try and force it down people ’s throats now would undoubtedly arouse renewed resistance. Perhaps it was too big a bite to be swallowed in one piece. It needs to be unbundled and presented piecemeal. That is in keeping with the method of the piecemeal engineering which proved so successful in the past. The most valuable and most needed piece is a common foreign policy which would guide a common defence policy. That is the baby that was thrown out with the bath water. That should be the priority and it would not require a referendum. I see the merit of a bill of rights but it does not have the same sense of urgency about it because there are so many declarations already in force. If giving the Charter the force of law requires referenda, it may be better to wait until Europe has regained its momentum. Simplifying the decision-making process is more urgent, but that is something for the Member States to negotiate with each other in a revision of the Nice Treaty and it is unlikely to interest the general public. What is of general interest is to improve the integration of immigrant communities. These are the outlines of a practical programme for moving the European Union forward again. In the meantime, the absence of institutional reform should not be allowed to serve as a pretext for inaction. - and the prospect of using trade, aid and the prize of membership as catalysts to encourage neighbouring states to become open societies. Regrettably, the EU has not made full use of its potential. Europe has made little progress in formulating a common energy policy. As a result it is increasingly dependent on Russia, and Russia has not hesitated to exploit its bargaining position. The EU has failed to give adequate support to Georgia or to impose adequate sanctions on Uzbekistan for the massacre in Andijan. The European Neighbourhood Policy never gathered any momentum and the treatment of Turkey is pushing an important ally in the wrong direction. Needless to say, a common European Union foreign policy should not be anti-American. Such a posture would be self-defeating because it would reinforce the division of the international community that the Bush administration has initiated. I am speaking about the European Union setting an example in international cooperation that eventually the United States under a different leadership — which is on the way — would emulate. By the same token, a global open society emphatically does not mean global government. Government inevitably interferes with the freedom of the individual. A global government could not avoid being repressive even if it were built on liberal principles. A global open society could not even be as closely integrated as the European Union because the affinity among the member states would be less pronounced. What a global open society does stand for is the rule of law on an international scale. According to the neoconservatives who have exercised such a nefarious influence within the Bush administration, international relations are relations of power, not law. According to them, international law merely ratifies what military power has accomplished. To some extent that is true today. For instance, the United Nations has ratified the occupation of Iraq which had been brought about by illegitimate means. But it ought not to be true tomorrow. International relations, including the exercise of military power, ought to be governed by international law more effectively than they are today. Europe as the prototype of a global open society is an abstract idea. Whether it is strong enough, persuasive enough, to serve as the unifying force guiding the European Union forward, remains to be seen. One thing is certain, the process that has carried the European Union so far cannot be revived in the same form as before. It was driven by an elite and the population at large has felt left out. This cannot continue, if for no other reason than on account of the referenda that are used with increasing frequency. A referendum expresses the people ’s will in a raw, capricious form without the intermediation of an elite. Therefore, if the European Union is to revive, it has to be by popular demand. One way or another, civil society has to be mobilized. The elite has a role but it is to shape public opinion. I can only speak for myself. I find that the idea of Europe as a prototype for a global open society is very inspiring indeed. Although I am not a European citizen, I am a believer in the open society. I have a network of foundations inside and outside the European Union committed to promoting that idea. I am ready to support an Open Society Initiative for Europe that would mobilize civil society behind the idea of Europe as a model and a motive force for a global open society. The world badly needs a more united Europe committed to the principles of open society and I hope Europe will rise to the challenge. We are addressing no less a question than what we mean when we say “Europe”. Do we mean a zone in which every nation seeks to extract for itself the maximum benefit, at best observing a fair balance of interests? No, we see Europe as a community of Europeans, drawing energy from their diverse cultures in order to hold their own in the world together and to interact peacefully and productively. This view alone is the rationale for our initiative, which seeks to use culture to promote Europe ’s development. The process of European unification needs a soul in order to secure not only external development but also qualitative progress, without which it cannot achieve stability. Our concern, then, is with the future of Europe, not with ensuring a thriving culture. We are not lobbying for culture when we say that Europe must use its cultural energies to move forward. I. Where do we stand? The first Berlin Conference in 2004 was the initiative’s kick-off event. Happily, it set in motion the “Berlin Process”, which is scheduled to run until 2008, meaning that we have now reached the halfway mark. During and after the conference, we were able to win the support of strong partners and allies that share our ideas and are helping to implement them. We are a civil-society initiative of European individuals determined to maintain our independence with regard to both the substance and organization of our work. This is what gives our work its impact. The world is becoming increasingly complex and more difficult to control. We believe that there is less and less justification for delegating the responsibility for public affairs to professional policymakers. This responsibility must be shared by the citizens of Europe. What we want is a Europe of Europeans. It is the citizens themselves that must increasingly provide the impulses – not acting on behalf of the state and its policy-makers but as their partners. If civil society is to effectively assume its share of responsibility and bring its influence to bear, new forms of cooperation are needed between civil society and policy-makers. That is why we have, with the active support of the Steering Committee in the European Parliament, tried out and put into practice a new model for cooperation between civil society and policy-makers. This model gives our private commitment the chance to have a public impact, maintaining the autonomy and informal organization of our civil-society initiative and at the same time enabling it to influence public affairs. This model has proved successful, thanks to the members of the parliamentary Steering Committee, in particular its Chairman, Professor P öttering. They have not only served as active intermediaries between the initiative and those wielding political power but have also provided important advice. They have proved themselves to be true representatives of the people. II. What do we seek to achieve? Conference and the self-set limit of 2008, by which time we aim to have brought our work to an initial conclusion, as agreed with the sponsors, the Steering Committee and President Barroso. By involving young Europeans from many different countries, the 2004 Berlin Conference already achieved a substantial multiplier effect among those belonging to the generation that will be shaping the Europe of tomorrow. This time, their number will be considerably larger, and we wish to thank all those who have helped secure their participation or have contributed to the complex organizational and logistical work this entailed, in particular the People Network, courtesy of our partner, the Felix Meritis Foundation, Amsterdam. Over the next two years, we plan to put the initiative “A Soul for Europe” increasingly in the hands of the younger generation, gradually making ourselves – the original initiators – superfluous. The first Berlin Conference in 2004 gave rise to a series of projects that are carrying forward the impulse it provided and giving concrete form to various facets of the underlying idea. How are these five projects helping to implement the concept? a) They are demonstrating that its implementation is feasible and worthwhile. 1. Firstly, “A Soul for Europe” means holding a conference at regular intervals to assess the extent to which the political and social actors working for Europe are harnessing cultural energies to achieve their goals. Secondly, it means designing the conference – as we have done in Part 3 of this year’s conference – in such a way as to make Europe a platform for debating cultural issues of strategic importance to the world as a whole. 2. And secondly, “A Soul for Europe” also means bridging the emotional gap between the European public and European policy-makers. This is the goal of the project “Discourses on Europe”, a public forum at which representatives of Europe’s intellectual and artistic elites will present their thoughts and ideas to members of Europe ’s institutional elite. Daniel Barenboim will begin the event and then pass on the baton to Wim Wenders. 3. Thirdly, “A Soul for Europe” means using culture to help define Europe’s contribution to the world credibly and in concrete terms. In this context, we will, in Part 3 of the conference, be discussing the Jewish-Islamic dimension of Europe and, in tomorrow ’s session with Commissioner Ferrero-Waldner, the ALEPH project. 4. Fourthly, “A Soul for Europe” means ensuring the systematic and sustainable stabilization of social and economic structures by means of local and regional cultural activities. This is demonstrated by the project “Culture for Regional Development”. 5. Fifthly, “A Soul for Europe” means reaching out to the cities and regions, which are the true purveyors of European culture, and creating there a broader awareness of the fact that cultural work is work for Europe and that the citizens of the cities and regions share the responsibility for Europe. 6. Sixthly and lastly, “A Soul for Europe” means using film as a medium and art form, in which Europe’s soul takes shape in an especially direct and effective way, to communicate – in particular to young people – a personal image of Europe and help them see themselves as Europeans. Over the next two years, these projects will be consolidated and brought to a conclusion, enabling us to undertake an overall assessment of the initiative at the 2008 Berlin Conference. The soundness of the idea “A soul for Europe” has been demonstrated. What we now need to do is multiply the initiative’s impulse. The small, informal initiative alone is not up to a challenge of this scale. Many other organizations with a cultural or general European orientation are pursuing the same goals as the initiative “A Soul for Europe” without explicitly expressing allegiance to this cause. It is natural that those who feel a sense of commitment to the idea of “A Soul for Europe” should join forces in what we call an “Alliance”. This creates synergies and enhances the project’s impact through the profession of belief in a shared goal. The Alliance accords equal rights to all those involved, respecting and preserving the diversity of the various partners. The partners are bound together only by their commitment to the common cause. The two Berlin Conferences, held in November 2004 and November 2006, brought together representatives of international cultural life, the business sector and European policy-makers as well as young Europeans – many of them from the accession countries and the EU’s neighbours – to demand that instead of being merely an economic community of interests Europe should be a community of Europeans making use of their cultural assets and potential. 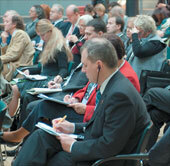 - for promoting structural and regional policy to support the development of Europe ’s regions. Opening up and developing Europe’s cultural dimension is also a basic requirement for securing the commitment of the young generation of Europeans, who will constitute the Europe of tomorrow. The civil-society initiative “A Soul for Europe” is supported by a high-ranking Board of Trustees and a Steering Committee in the European Parliament, which links the work of the private initiative with that of political decision-makers. The initiative is thus practising an innovative, forward-looking model of cooperation between civil society and policy-makers, which is based on two principles: the independence and autonomy of the private initiative, and the willingness of parliamentarians and decision-makers to act as intermediaries in dealing with the power elite. The Berlin Conferences are one of the projects of the initiative, which from its base in Berlin is developing an international network and seeking active support for its goals from the cities and regions, in the EU member states as well as in the worlds of culture, business and European policy-making. Hannes Swoboda and Jacques Toubon as well as Erhard Busek and Christian Schwarz-Schilling. 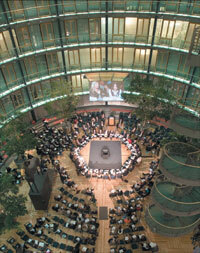 The Second Conference held under the auspices of the ‘A Soul for Europe’ initiative was held in the hall of the Dresdner Bank building, next to the Brandenburg Gate in Berlin on 17 to 19 November 2006. It brought together about 500 participants; members and officials of the European Commission, the European Parliament, the Council of Europe and several national parliaments, together with representatives of civil, business and artistic society, including a wide range of young participants from countries that are not yet members of the European Union. The EU Ministers for Culture were represented by Minister Isabel Pires de Lima (Portugal) and State Minister Bernd Neumann (Germany). The 2006 Berlin Conference recognised the potential of culture as an indispensable force in the process of European integration. It gave added impetus to the purpose of reshaping Europe in a way that engages not only the political and economic but also the creative aspirations of its citizens. In a passionate speech, the film director Wim Wenders called on the political establishment to rejuvenate enthusiasm for a Europe that celebrates civilisation, promotes humanism and enables its people to realise their dreams. After the opening statements the conference discussions were divided into a number of sessions designed to explore in depth the variety of challenges facing Europe and to suggest practical means of addressing them. The first day looked at harnessing European culture for the economy, cooperation between civil society and public bodies, and the intention to create an alliance of organisations to promote the ideas behind ‘A Soul for Europe’ over the medium term. The second day looked more closely at political realities. Discussions focused the definition and purpose of Europe, culture as an element of policy making, Europe ’s world position, and international social cohesion. The final session on 19 November was open to a wider public and devoted to exploring the Jewish and Islamic dimension of creating an open Europe. On issues between public bodies and civil society several speakers from the ‘accession’ countries felt that too little progress had been made in modernising cultural policies or financial and institutional models. Too often thinking was confined to the national perspective and the structures discouraged people from forming or participating in networks that could widen the view. Ivan Krastev, of the Centre for Liberal Studies in Sofia, was concerned that European states were proving adept at recognising difference but were losing respect for dissent. The session on the definition of Europe concentrated on the need to find ways of using the media to transform itself into a more responsive agent of integration. Europe needs to be treated as domestic, not foreign, coverage. Translation is vital but so too is the need for journalists and editors who are able to be mobile and to harness contacts outside their own national territories and language groups. Many of these themes and concerns were reflected in subsequent sections of the conference. Former French Culture minister Jacques Toubon called for a substantial upward revision of the finances for cultural co-operation in the European Commission ’s budget from 2008 and others stressed the vital contribution of the Council of Europe in helping cultural policy reform. Much of the debate centred on how to take the initiative and themes of the Berlin Conference forward in the coming years. The prospect of the Year of Intercultural Dialogue being held in 2008 provides a context and focus for activity in the medium term. The Conference looks to the programmes for that year to demonstrate Europe ’s ability to play an active role in global dialogue, to lay firm foundations for permanent engagement and to establish the appropriate institutions and programmes to ensure the dialogue is fruitful. The Berlin Conference invited the key organisations in Europe ’s cultural and political life to form an alliance that could press for transformation and monitor its progress. The alliance would seek out new partners and develop the relationships with the institutions of national governments, the European Union and the Council of Europe. It would link organisations promoting the development of Europe and gaining the support of its citizens, organisations that foster Europe ’s cultural strength, public European institutions and those with national or international mandates, and private organisations and foundations bound to the European ideal. The goal of the Conference and the Alliance that stems from it is to broaden the vision of Europe beyond the utilitarian necessities of economic and regulatory harmonisation. It is to ensure that integration is based on the cultural potential in all areas of policy and on the centrality of an open and inclusive cultural policy leading to successful reform, social cohesion and prosperity. In the coming years the work of the initiative will be broadened, deepened and rejuvenated through subsidiary meetings, political advocacy and evaluation. It will reconvene as the Berlin Conference in 2008 to review progress.